Happy hump day! Only two more days and it’s the weekend. Is it wrong that I am already thinking about the weekend? It kind of stinks that I have to work on Sunday afternoon, but I’ll make the most of my Friday night and Saturday then. 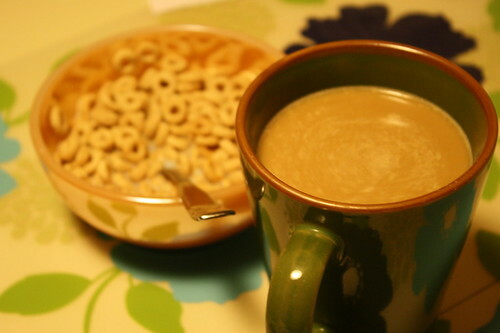 Breakfast–plain old boring Cheerios and coffee. I didn’t feel like anything else. 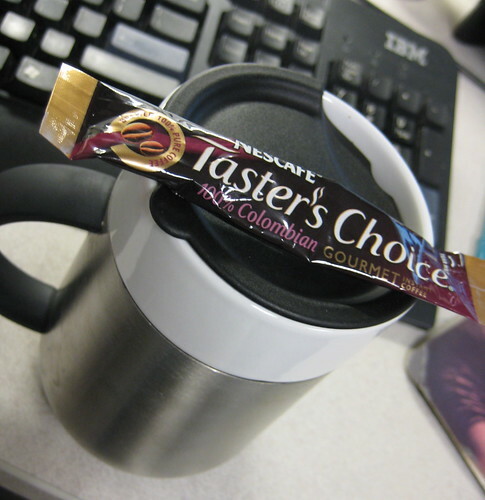 Snack at work was Nescafe instant coffee that I got free samples of through Thunderfap.com or one of those sites. 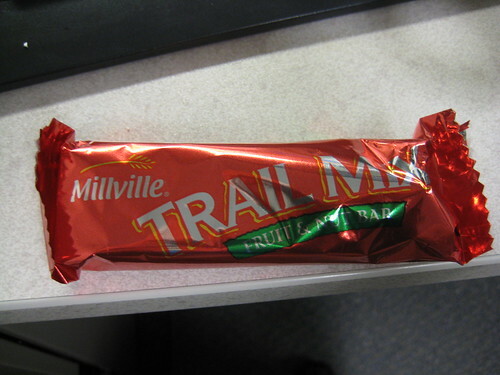 I also had an Aldi trail mix bar. This bar is a bit sweet for me. I think I better look at the ingredients before buying again too. 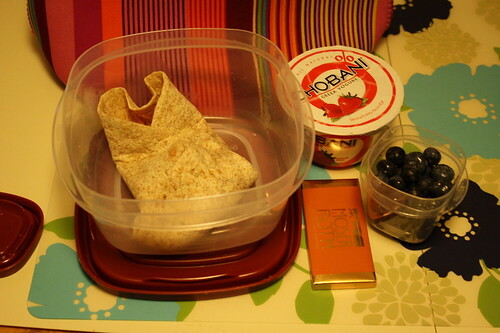 Lunch was a whole wheat tortilla with refried beans, shredded cheddar cheese and of course, Frank’s Red Hot sauce. I also had a strawberry Chobani yogurt and added fresh blueberries to it. Dessert was a toffee Moser Roth chocolate bar from Aldi. I meditated when I got home from work. Today, I practiced without my husband and I did well. I started out better than I did in the middle with controlling my thoughts. Don’t worry–I won’t talk about my meditation every day. I may just blog about any affects I have noticed from it over time. 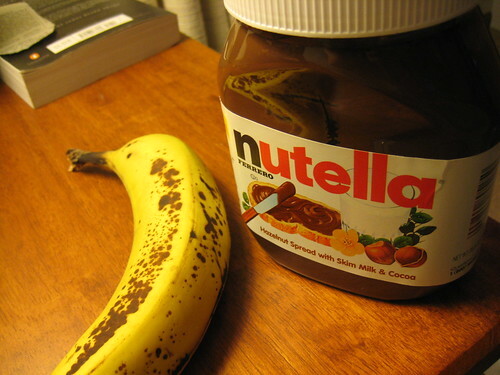 Dinner was a banana with some nutella and breakfast taquitos. 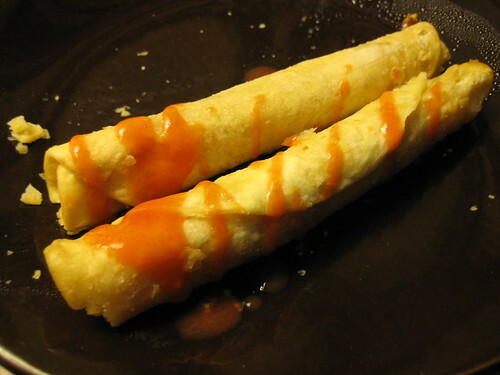 Blame my husband who buys those and was making them–I couldn’t resist the quick meal tonight. I was going to go to the gym tonight, but decided I could really use a rest day to relax my body and also do dishes, organize coupons and read my book. I also had planned on (finally) leaving work early and then 3:30 hit and multiple e-mails came in that demanded my immediate attention. I wanted to go to Zumba, but that didn’t happen because getting out of work once again affected my workout schedule. And I wonder why I am counting down the days till the weekend. When I was organizing my coupons, I realized I really need to find a good (cute) coupon organizer. Using the envelope system isn’t working so well right now. I think I am going to keep searching on Etsy. 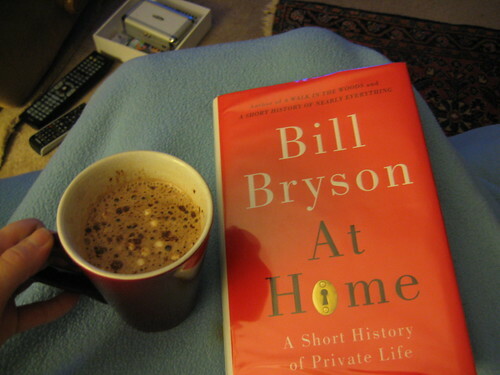 So, it’s the part of the evening where Bill Bryson’s book is calling my name. Hope I don’t fall asleep while reading because I feel super tired right now.